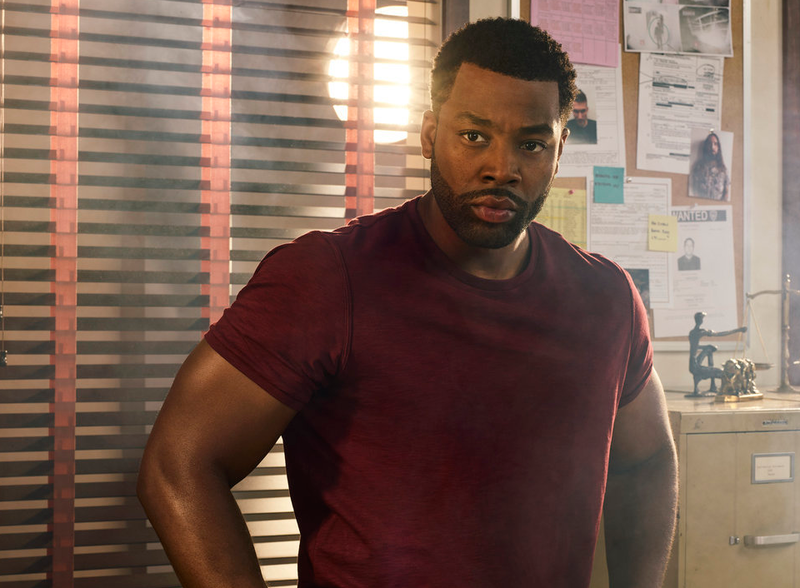 Tonight’s Chicago PD episode “Night in Chicago” was certainly different than any other we’ve seen — especially for LaRoyce Hawkins’ character of Kevin Atwater. Over the course of the episode, he was racially profiled while undercover by a fellow cop, one who mistreated and tormented him — in addition to shooting one of the criminals Atwater was working for his case. Yet, the important line that is worth noting is that he wasn’t being a criminal at the time the cop pulled them over. Things didn’t escalate until later. This was a painful, harrowing episode for Atwater, one that ended with him in a darker place than we’ve seen. In the closing minutes, we saw Atwater pay the arresting officer a visit, bring him out to a back alley and then hold him at gunpoint to see how he liked it. Before that, there were plenty of other intense scenes, including Atwater’s fury after getting out of police lockup and Voight being unable to calm him down. In the second part of our interview with Hawkins (read part 1 here), the actor talks to CarterMatt about some of the most challenging scenes to film — including a rather fascinating story about the pool scene that took place at the start of this episode. For those of you who love behind-the-scenes stuff, this is right up your alley. CarterMatt – What were the most challenging parts about filming this episode? LaRoyce Hawkins – Sometimes, we shoot things out of order. That’s what messes you up sometimes, because you can fall into the trap thinking about the order of the day, or the order of your arc. Sometimes, I’ve made mistakes where I think ‘I know what I gotta do when I get to work today,’ but the day may not be conducive to the arc necessary. I may have killed it on the day, but not so much on the arc. The challenge is when you have all of these [individual] moments that you want the world to remember, and sometimes the hardest part is keeping the timeline for yourself so that the journey tracks authentically and you’re not affected by the day because you had an off day or an extra-on day. The audience shouldn’t be able to tell that you shot these scenes in a few days. One of the scenes that stood out for me was when I was storming out on Voight — I haven’t seen that scene [at the time of this interview], but I do remember Jason [Beghe] being extremely generous and being an advocate for that moment of me storming out and him being behind me, like a little Voight behind a big Atwater that Voight can’t calm down at that moment. Eriq La Salle — he’s a genius and there’s nothing that he can’t shoot exceptionally well. The thing I’ve learned about him is that the more you prepare to come and cook, the more you have a meal. You have to come to set with an appetite. I remember coming to set that day with an appetite to cook and Jason had some good ideas. My energy sometimes carries things to another place and before you know it, we’re telling a story we’ve never really told before. This was probably the most powerful challenge, honestly, but it was so much fun — the pool parts. Are you a good pool player? I’m pretty good. I’ve been playing pool most of my life. I had to get my stroke back on this episode because Eriq La Salle’s original intent was to shoot all of those pool scenes minus cuts. He wanted you to know how good Atwater was at shooting pool, so we did a lot of Steadicam moves where I had to hit five or six balls off the break. The same pool hall that we shot all of those scenes in, I was going there for like two months prior to us shooting there, just playing pool. Just late nights, closing the pool hall down sometimes at three in the morning. What’s crazy is that the manager of the pool hall had no idea I was Atwater from Chicago PD until the day I came to film… The manager of the pool hall ended up being a pool tech adviser and a pool stunt-double for the guy I was actually playing.